We are pleased to announce that Onyx Medical Aesthetics is now one of only 5 clinics in all of Ontario offering breakthrough PicoSure laser tattoo removal with picosecond technology. We are also the only clinic in all of South Western Ontario with a PicoSure machine. Picosure is the world’s first and only picosecond aesthetic laser. This unparalleled breakthrough in laser technology delivers ultra-short pulse bursts of energy into the skin in trillionths of a second. Picosecond pulse width is 100 times shorter than nanosecond technology, enabling unmatched photomechanical impact for better clearance with fewer treatments and less fluence. 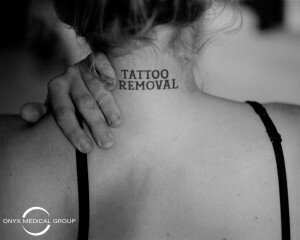 We all have past experiences that we would like to erase, and for millions of Americans, this includes body ink. Research shows that the number of US adults who have a tattoo has increased to 45 million, or one in five (21%). This includes over half (60%) of all women over the age of 18. With the rise in tattoos, tattoo regret has also been prevalent. In fact, research has shown that 20% of individuals with body ink have tattoo regret. The amount of tattoo removal procedures models this trend, demonstrating an increase in 2011 of 32%, and an even higher percentage, 43%, in 2012. It is apparent from these statistics, and the increasing number of tattoos, that the tattoo removal market is growing at a significant rate. With the PicoSure laser tattoo removal machine, we are able to guarantee our clients that their tattoo removal needs will be met.